2007 was a turning point for RPI. We received our Forest Stewardship Council® (FSC® C022074) certification by SCS Global Services. Prior to the certification RPI qualified for a grant to unify workflow solutions under the guidance of lean manufacturing. 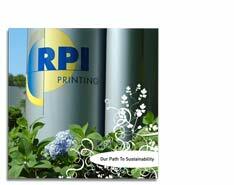 As a result, we showed a significant reduction in waste across the print production chain. Since then RPI has been on the path to sustainability. RPI invested in an energy star qualified digital printing press to offer digital printing products that minimize the amount of ink, paper and energy required for mass mailings. Return and reuse programs such as operator replaceable components for the digital press are in now in effect. Non-petroleum inks that are naturally low in volatile organic compounds are now used for offset printing. Recycled paper with high levels of post-consumer content is purchased for make-ready. Recycling programs are in place for aluminum plates and paper waste. Paper stocks that have less environmental impact are now purchased and offered as a standard house sheet. Other forms of communications that use less energy have been introduced to RPI’s product line. All future imaging and office products will be energy star qualified, reducing by as much as 60% the electricity consumed on standard equipment. RPI’s continued search for other alternative forms of energy and ways to decrease carbon dioxide emissions are an on going journey for sustainability.